While Codeception uses PHPUnit under the hood to run its tests, it’s been fiddly (at best) to get Codeception tests to run quickly and easily in PhpStorm, until now. PhpStorm 2017.1 brings a Codeception specific test runner that makes it much simpler to configure your Codeception test runner, and to run specific batches of tests right from within your IDE. First, we need to tell PhpStorm where to find the Codeception executable on our system. In my case, I’ve installed Codeception using Composer, so it’s in the vendor\bin folder. You can find these settings under Languages & Frameworks | PHP | Codeception. Next, we just create a run configuration using the Codeception type from the run configuration drop-down menu in the toolbar. The easiest way to configure the runner is by using the Type option – you can run just your Acceptance, Integration or Unit tests, or run all tests. I’m running just the Acceptance tests. If you only want to run the tests in the file that you are in, you don’t need to create a full configuration. If Codeception is configured correctly in PhpStorm, you can just right-click anywhere in the file and select Run, and then click the filename with the Codeception logo next to it. Now, we can run the test using either the play button next to the configuration drop-down or by using the CTRL+R shortcut. As with the other test runners, we get all the benefits of running tests inside PhpStorm, including click-through to failed or skipped tests. It’s also worth noting that like all the test runners in PhpStorm, the Codeception runner works for both local configuration and remote configurations (including Vagrant and Docker). I’ve started playing with Codeception again after a number of years not using it, and it seems to have improved a lot since I last looked at it. I’m looking forward to working with Codeception in PhpStorm. As with all the improvements, give it a go, and let us know what you think. This entry was posted in Cool Feature, Early Access Program, Newsletter, PhpStorm and tagged phpstorm 2017.1. Bookmark the permalink. Great job! We’ve been hoping you’d get around to this for a while! I look forward to trying it out. More and more development is done with locally run virtual containers. Is there any different instructions to run Codeception tests inside a docker instance? To summarise, you need to create PHP remote interpreter based on docker image, create new Codeception configuration based on that remote interpreter and then run your tests as usual. If there are any problems please contact our support team (Help->New Support Request…). So excited to try this out! Codeception is an amazing Framework. Kudos for the much anticipated integration. My only complaint now is the inability to generate coverage via Codeception the same as PHPUnit. Also generating tests similar to PHPUnit would be amazing. Yes, but I prefer to use the Codeception unit test format. 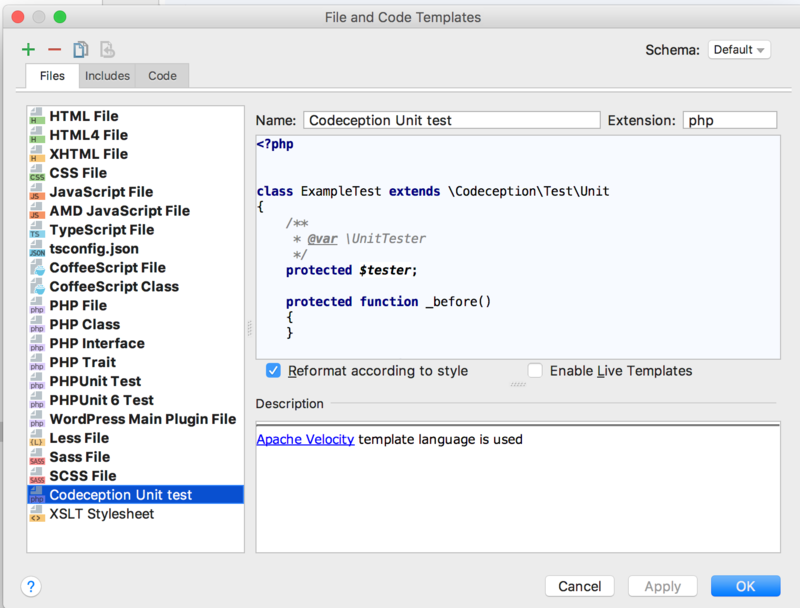 The ideal would probably be to have the ability to define a template for the generated tests using the “Create New PHPUnit Test” dialog. Got a test env set up in 10 mins. Now running push-button acceptance tests straight off my code view. Many thanks, @geeh!